This past weekend we had a 2-day (Friday/Saturday) garage sale that sold out 100% in day 1, leading to “Sold Out” signs in the front yard to alert all the bargain hunters on Saturday morning. So how did we manage to get rid of every single item on Friday, which I expected to be the slower of the 2 days, without having to send anything to Goodwill? My mother-in-law is moving out of her house of 20+ years this month, so you can imagine how much stuff had accumulated in every closet and no-longer-used bedroom. Three weeks before the garage sale she had us come over for several hours to clean out some of the upstairs rooms and sort things between 3 options: keep, trash and garage sale. I have organized several garage sales over the years, some personal and others as youth group fundraisers. I have also sold thousands of items on eBay and Craigslist in the past, so I have learned a few things over the years. I knew right then that I needed to start preparing to advertise the garage sale, so I took pictures that day of as many garage sale items as I could. During the following weeks Jennifer and I began going through our own house and garage, adding many of our own items to the garage sale. Jennifer’s brothers did the same thing, and with 4 households involved we ended up with quite a large selection. There is always junk at garage sales, but we also had some nice furniture, several tables of nice children’s clothing, lots of baby toys, unused household goods, etc. The big-ticket items included 2 barely used PowerWheels Cars from our house and a 73-inch Mitsubishi TV from my mother-in-law’s house. I even went through all my family’s garage sale items and kept all the nice toys that I felt like I could sell online for a higher profit than at the garage sale, and I started my own Amazon seller account. I think we have just about every Disney toy from the last decade, so I did not want to sell all these for 50 cents apiece at the garage sale. Click here to see all the items I have for sale on Amazon! As the garage sale inventory grew, I kept taking pictures whenever I got the chance, but I did not post anything on Facebook or Craigslist until the night before the sale began. I did not want to be bombarded with strangers asking to buy stuff before the garage sale, so I waited till around dinner time Thursday night. Honestly I expected mediocre sales on Friday, but for lots of people to see my online posts during the day Friday and come out for the sale on Saturday morning. Jennifer listed the garage sale in the local paper, but no one would see that listing till Saturday morning. The newspaper would have little effect on this garage sale, and I knew that online advertising was key. Using all the pictures I had been taking, I took 3 steps to advertise online. Craigslist is an old, reliable favorite for selling things locally, and I always make sure to list garage sales here. You can only add 12 pictures to a Craigslist ad, so my pictures were of limited help here. I did not feel like typing out every item we had at the garage sale, as I wanted the pictures to do the talking, so I just picked out 12 of the best pictures and said that we had tons more. One way I could share unlimited pictures of the garage sale was to simply create a new Photo Album on Facebook. While I made it a public album, I knew that this would only reach some of my friends via their News Feed, and to be honest, the majority of my Facebook friends live in Tennessee and Indiana. Since we just moved back to Guntersville, AL a year ago, and I did not grow up here, I simply do not have hundreds of Facebook friends here. However, my wife and in-laws know just about everyone in our small town. So I added Jennifer and all her family as contributors to the Facebook album so that their local friends would also see the pictures. In the last couple years Facebook has really improved the options for selling things locally. The Facebook Marketplace and easy-to-use selling groups are amazing tools. After posting to Craigslist and my own shared Facebook album, I started posting in all the local selling groups. One thing I discovered is that if you are a member of multiple selling groups, you can actually just create 1 listing and have Facebook automatically post that same listing to whichever selling groups you choose from your list. I shared my post to about 5 different local selling groups. You can only add 42 pictures to a selling group listing, but I had about 100 pictures. To let people see more than the 42 pictures, I added a comment to my listing, sharing the link to my larger Facebook album. Once I listed the garage sale in the local selling groups, I quickly realized that this is the best way to sell locally now. Everyone and their mom wanted this Step2 Push Around Sport Buggy. I probably had 25 people contact me on Facebook asking for this push car. I have a lot of good memories with this, and I have pushed my kids many hundreds of miles in it. I used to take them on long 5-7 mile walks with it, and it held strong over the years. Click here to get one for yourself! My iPhone was blowing up with Facebook notifications over the next several hours. I received dozens of comments, questions and private messages about items in the garage sale. At first I tried to reply to as many as I could, hoping to generate sales, but then it became too overwhelming to reply to everyone while we were busy setting up for the garage sale. Our garage sale was really creating a buzz on the local Facebook sales groups, so I was starting to feel good about the potential sales. I had no idea just how well the Facebook advertising would work until the next morning. 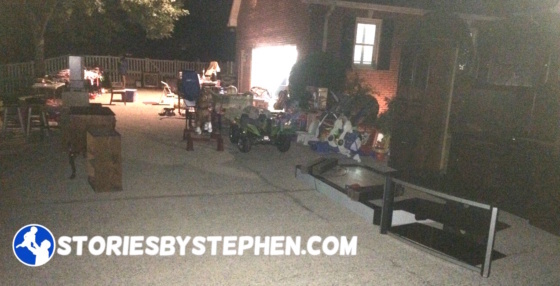 We worked late into the night Thursday night getting everything setup and priced for the Friday morning garage sale. We worked past midnight moving furniture to the driveway, setting up tables filled with clothes and home goods, and putting price stickers on hundreds (maybe thousands) of items. Then I spent a couple hours replying to people’s questions till about 3 in the morning. I slept for 1 hour Thursday night, and then I was back outside before 6 am ready for the early-birds. We advertised a 7 am start time, but I knew people would arrive by 6 am. I was correct, and we were pretty busy between 6-7 am. One man in particular arrived and bought a whole truckload of our best furniture pieces around 6:30 am. He told me he was buying inventory for a new thrift store he was opening. I did not think too much of his comment until another lady named Theresa showed up around 8 am eyeing many of our best pieces. She hung around for quite awhile and was pulling aside hundreds of dollars of items. Theresa also mentioned that she ran some thrift stores, so I told her about the man who bought a truckload of furniture a couple hours earlier. She told me that he was her brother-in-law and that they work together. 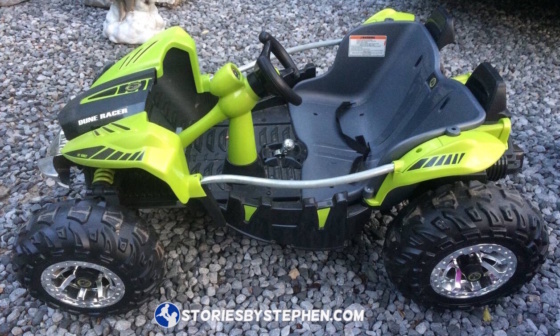 We were really sad to get rid of this Fisher Price Power Wheels Dune Racer. (Click here to get one.) I mean what’s not to like about this thing?!? We also sold a pink princess SUV. 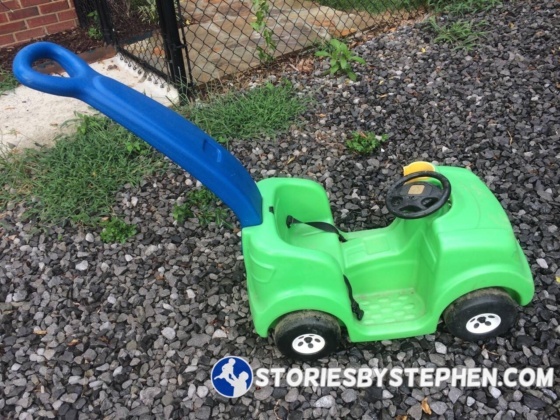 We got these Power Wheels when we lived in Indiana in a flat neighborhood with sidewalks, but now we live on a dangerous, curvy, hilly road. Our house is on a giant hill, and there is nowhere for the kids to use these. They were a ton of fun for the short while they got to use them in Indiana, but it was time to get rid of them and clear out some space in our garage. Everyone wanted these cars. A few minutes later as I was talking with Theresa about her growing pile of items, she caught me completely off-guard with what I first thought was a joke. She asked me, “How much would you want for everything?” Theresa was not joking, and she was really offering to buy out our entire garage sale! She and her business partners own 2 thrift stores in nearby towns, and this is apparently their business model. They send her brother-in-law (the man with the truckload of furniture) around to scout out the local garage sales and to buy some of the top items before they are gone, and when he finds one with a ton of great stuff, she comes and tries to buy the entire lot. They obviously follow the local selling groups on Facebook, and she saw on Thursday night how much activity there was on my listings. It turns out that my Facebook posts quickly generated enough local interest that she knew we were the garage sale she would target that week. 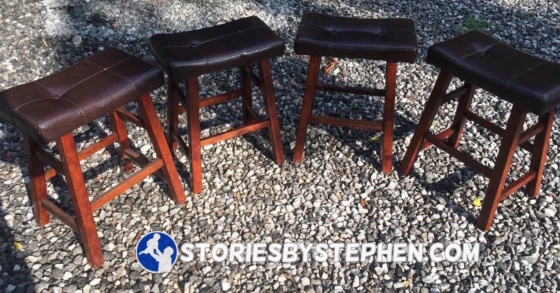 I also got tons of requests for these bar stools. They were one of the 1st items to go, as Theresa’s brother-in-law bought them at 6:30 am. I had not considered a price for the entire garage sale, so I did not know how to respond. I was still in shock and feeling skeptical about her offer. There were 2 thoughts that quickly popped into my head, and neither of them were about money. If this lady buys our whole garage sale, I don’t have to come out here and do this again tomorrow! If she buys everything, that means she is responsible for moving all this stuff, and we will not be left with half a driveway of unsold garage sale inventory that we have to load up in several cars and carry to Goodwill. This sounded very appealing to me, and my mother-in-law and stepfather-in-law just wanted everything gone, out of the way before they move. So if we could work out a decent deal with Theresa, we should definitely let her remove this burden from us. At this point she could tell I did not know what to say, so she offered $1,000 for the rest of the garage sale. This is not an insignificant amount of money, but I knew we could potentially make more because we really did have a good bit of quality stuff. After discussing it with my in-laws, we countered and settled on approximately $1,500. It was only 8:30 AM at this point, but we had sold a few hundred dollars already. I knew that we might could still get more than $1,500 by the end of Saturday, but I would rather make a couple hundred dollars less, have everything gone on day 1 and have my Saturday free. This is where things got a bit tricky. Theresa did not have $1,500 cash on her, but she showed us her $4,800 paycheck from a job with one of her other businesses and promised that she was good for the money. This check was from a PNC Bank account, and we do not have any PNC banks locally. There are several in Huntsville, about an hour away, so she told us she would go straight to the nearest PNC Bank to cash this check and come back and pay us cash for the rest of our garage sale inventory. Both parties agreed that we would keep selling stuff until she paid us for the lot, but we did agree to put “Sold” signs on several key items, including the PowerWheels and the 73-inch TV. She gave us a $75 down-payment and left to go get cash. She was gone for 6 hours! We kept selling all day long, and Theresa just never came back. We got the occasional vague text message excuse from her, but after a few hours we were getting frustrated, wondering if this was some sort of scam. She had not taken any of our items with her, so it’s not like she was stealing from us. Something was off, but it didn’t make sense that it was a scam. Just to be safe, we got a counterfeit bill detector pen from Domino’s Pizza (one of my mother-in-law’s restaurants), and we planned to check every bill that Theresa gave us, if she ever came back. We thought that even if it was not a scam, maybe she was going to several other yard sales and just leaving us hanging. We were definitely concerned that the deal would not happen. It turns out that Theresa had a very long day herself, and she was not trying to rip us off or keep us waiting. She drove to the PNC Bank branches in Huntsville, but no one would give her $4,800 in cash. They all said it would deplete their cash reserves to serve other customers. After calling around, she found a different PNC branch that would cash the check, but it was more than an hour away in a different direction. She obviously had to eat lunch at some point. Then her phone died without a car charger, so she had to find a Walmart to buy a charger. It actually ended up working out for the best because eventually Theresa did show back up, and she had legitimate, non-counterfeit $50 bills. She was extremely nice and apologetic, and since we had been selling for several hours since she left, we negotiated a new deal with her. She still paid us $1,500, but knowing that my mother-in-law would find more stuff to get rid of as she packs up her house the next couple weeks, we agreed to give Theresa any other leftover furniture from the move. We were able to sell a few hundred dollars while we were waiting for Theresa to get back, and our grand total for the garage sale was $2,500! We tracked whose stuff sold for how much, and we divided the money up appropriately between the 4 households. Everyone got a good amount for what they put into the sale. That’s not bad for a 1-day garage sale! Not only is that the most successful garage sale I’ve ever had, but we got to cancel the 2nd day and not be stuck with a bunch of junk leftover at the end. Theresa and her husband made a few trips with their trailer and took everything! It really could not have worked out any better for us, and we were all glad to just be done with the whole thing. THINKING OF HAVING A GARAGE SALE? If you live near Guntersville and are having a garage sale, I will give you Theresa’s number. You might want to consider selling her your whole lot before your garage sale even starts, just so you do not have to deal with it. Or you might want to invite her to buy out your leftovers. If you do not live in Northern Alabama, I would recommend researching local people who use the same business model as Theresa. There are thrift stores everywhere, and they are not all for charity. For-profit thrift stores are real businesses, and they are always looking for quality furniture, household goods, toys, etc. I also highly recommend using the local sales groups on Facebook, and post lots of pictures. Also, if you have a garage sale and find yourself left with a bunch of stuff at the end, in some places the local Salvation Army will send over a couple people with a truck to haul off your leftovers as a donation. One last trick we learned that really keeps customers happy… We had probably hundreds of Disney Beanie Babies from my brother-in-law’s house at the garage sale. You would think these might be worth something, but they really are not valuable. People were buying them for about a quarter a piece, but we were giving them away for free to kids at the garage sale. We just let every kid pick one out of the box while their parents were usually looking through kids clothing. It didn’t cost us much money because we were selling them so cheap anyway, but it made the kids happy and kept them distracted a bit so their parents could shop (and buy) longer and more peacefully. Eventually we ran out of Beanie Babies because a lady bought the whole box for her grandkids, so we started giving kids stuffed animals and Matchbox Cars , which were also plentiful. 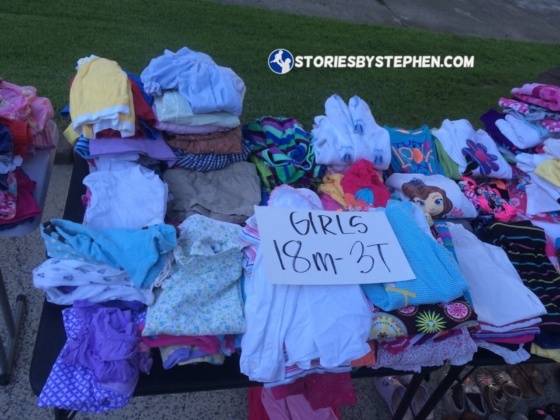 We had hundreds of kids clothing items for sale from our house. This is just 1 of the many tables of kids clothes. After several hours, we had sold countless grocery bags full of clothes (If you are selling clothes, always have grocery bags for customers. ), and the clothes tables still looked like they had barely been touched.